The eagerly awaited Sympulse’17- A Local Coalesce finally launched into action on 18th January 2017 in what proved to be a momentous day for the entire Organising Committee. The energy and enthusiasm was palpable, as the campus seemed to be doused in colours and was alight with excitement. Day One began with the crowd assembling at the field for Volleyball, and spirits soared as the crowd cheered for the participants, who were battling for glory.. The Academic Summit marked the official commencement of the fest. Every year, renowned personalities from various fields address the audience on topics relevant in today’s world. This year, our guests of honour, Ms. Shaheen Mistri- founder of Akanksha Foundation and CEO, Teach for India and Mr. Rajnish Rikhy Director of Response, Benet Coleman and Company Ltd., (Times Group), spoke about “Redefining Education with special emphasis on unconventional trajectories”. They addressed various issues that impact people across the globe, the link between media and education, and enabling children to be the problem solvers of today. The welcome address was given by Dr. Adya Sharma, Director Symbiosis Center for Management Studies-Pune.Representing SIU was the Dean, Academics and Administration, Dr. Bhama Venkataramani who is also the Founder Director of SCMS. The discussion was very fruitful and intriguing with students listening attentively through it, and seeking answers to their most relevant questions on the topic, in a heated Q&A session that followed. The highlight of the event was a 7th grader, Ganesh who attended the Summit with Ms. Mistri. He addressed the audience and shed light on unconventional educational trajectories he had experienced and in his own terms defining what qualities must be possessed by a good teacher. The Sprint events enthused the students around campus, like they do every year. 5-a-side football saw 20 teams go head to head in a battle of skill and fitness. On a day of hard fought contests, the best was saved for last as Wadia colleges 5 won their game after a marathon penalty shootout that was decided with its 15th kick. The preliminary rounds for basketball and volleyball were also held. The cultural wing of the fest, Ananya- sponsored by Bifrost, saw both participants and viewers flitting around the campus to watch and take part in the various events. The Hindi Duet Singing Competition- sponsored by 9XM saw the crowd crooning and singing along to their favourite tunes, and the Hogathon- sponsored by McDonald’s, saw foodies compete against one another to gulp down as many burgers as they could in a limited time period, without throwing up. The highlight of the day was the Talent Hunt, which was presented by F the Couch, founded by acclaimed actor and producer Mr. Suneil Shetty and producer Mukesh Chhabra. This casting company gave students the perfect opportunity to showcase their talents in various fields of music, film, television, theater or events. FIFA, the battle for virtual football supremacy, saw an initial cap of 64 participants doubled to 128. Such was the frenzy to register for the Ananya gaming event. With many players still left to go, Day 2 will only get better as the competition heats up.The Symulate workshop for all members of the various contingents of the event was an informative session on the sharing economy by using Wikimedia. 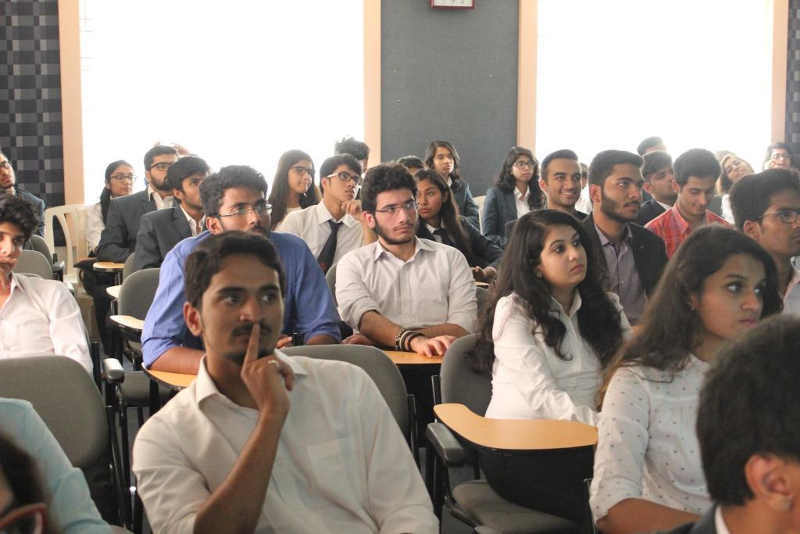 The speaker was Mr. Sanket Oswal who is heading the Indian chapter of Wikimedia, which deals with providing freely available content online through its branches such as Wikipedia, Wikinews, Wiki commons etc. The session was interactive where students asked queries and he answered questions and in the process further informed the students. They explored how information was edited and verified, how the company ran and legal issues faced by them. At the end of the session, students were left with a sense of being empowered to generate freely available public information about their own country to share with the world. 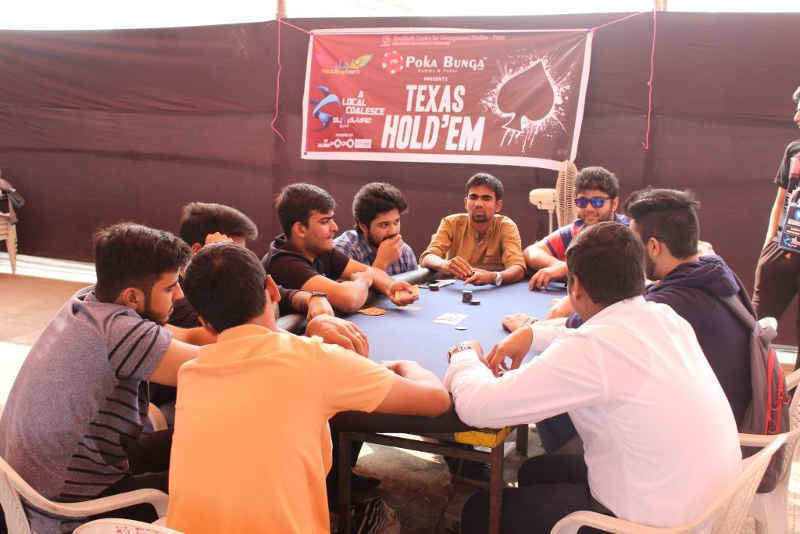 Headline Events got underway with the in demand Texas Hold ‘Em as participants came in large numbers to the SCMS terrace. After witnessing such intense competition on the first day, things are looking bright as we move to the next round. The last event on Campus for day one- EDM Night, had a great build-up to it and was headlined by a rising duo of DJs- Simorrish who certainly knew how to please the crowd! The music was perfect for the occasion and gave us all a night to hold onto. All the elements blended well together- from the stage to the visual effects and obviously the artists, to produce one unforgettable night for all those who were present. Day one set the bar high as we now await the rest of the days to come with bated breath, as thousands come together to experience the pure joy and elation of being a part of something this colossal.